A classic campfire treat! 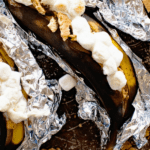 These S’mores Banana Boats are so delicious and easy. 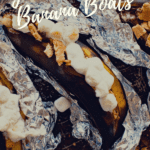 Such a fun banana boat recipe to make on your grill or over your campfire. Grilled Banana topped with gooey marshmallows, melted chocolate chips and graham cracker crumbs! Can you just picture this for a second? 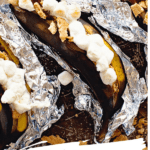 Caramelized banana loaded with toasty marshmallows, gooey chocolate chips and crunchy graham crackers? Essentially a S’more with a caramelized banana! I’m a LOVER of all things S’mores. 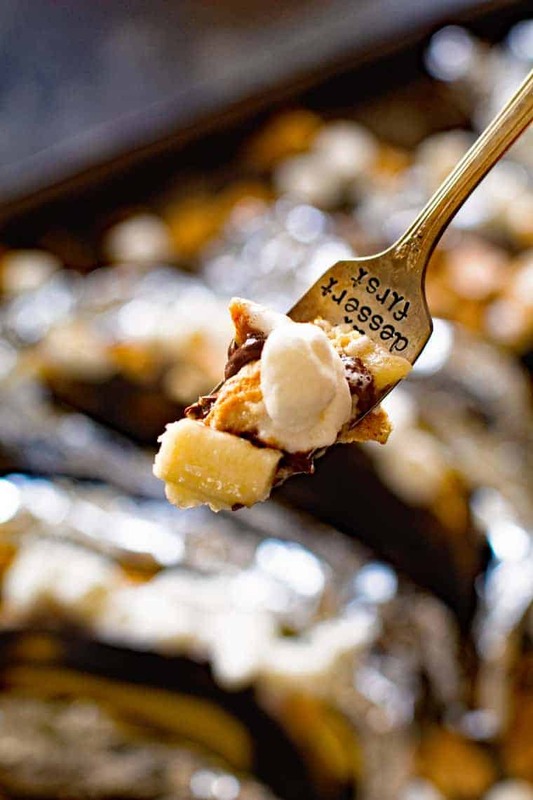 That’s why I’m a totally goner when it comes to this S’mores Banana Boat recipe! Now in case you came for a little humor today I got some when it comes to banana jokes! Ready? Ready? Here we go! Why do bananas wear suntan lotion? Because they peel! If a crocodile makes shoes…. what does a banana make? Slippers! Ok… let’s get down to business. I know you didn’t click on this to read my silly jokes, right? Do you love a great S’more? Of course you do, who doesn’t!! And the kids absolutely love them too! My kids FLIP when they know we are going to build a fire and roast marshmallows. Even my littlest runs for his little chair and waits for his S’more. Yes, it ends up alllll over his face but he’s SO happy it’s well worth the sticky mess! Today we’re going to take your favorite campfire fun dessert and make it even better! Bet you didn’t think that was possible, right? Yup, it is! 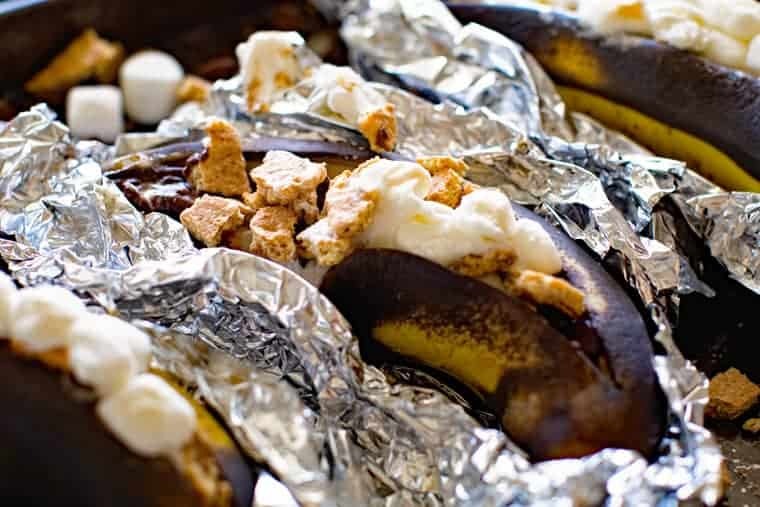 With this super simple and amazingly delicious S’mores Banana Boat Recipe! Crunchy graham crackers, melty chocolate chips, creamy marshmallows tucked inside a grilled banana. 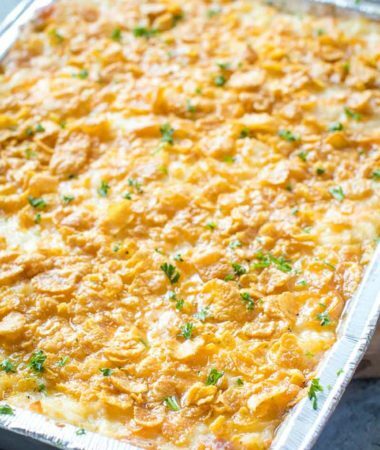 Cookout, campfire, sleepover, whatever it is YOU will be the star of the show serving up this fun, easy recipe! Here’s what you’ll need from the store to make these! I’m on a role with these jokes today, aren’t I? Cut 4 sheets of aluminum foil. Cut the banana lengthwise along the inside curve of the banana. Be careful not to cut all the way through. Open slit to form pocket. Place banana on top of foil. Hold each banana in your hand with foil. Fill pocket with chocolate chips, marshmallows and graham crackers. Fold foil around the banana and crimp to seal the foil packet. Place bananas on grill, cover grill and grill for 8-10 minutes or until marshmallows or melted. That’s it! This dessert is so simple and so good! More tasty grilled or desserts? I gotcha covered! Blueberry Lemon Cobbler – the perfect ending to any bbq! Grilled Pineapple – two ingredients, that’s it! Smoked Strawberry Crisp – the crunchy topping takes this right over the top! Ok… one more before I go… why did the banana go out with the prune? Because he couldn’t find a date! 😂😂😂 Sorry, I just couldn’t resist! 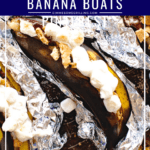 Enjoy this super easy delicious banana boat recipe! Now, you can see how easy these are to make below because I made a simple video for you to watch if you want to see me make them! 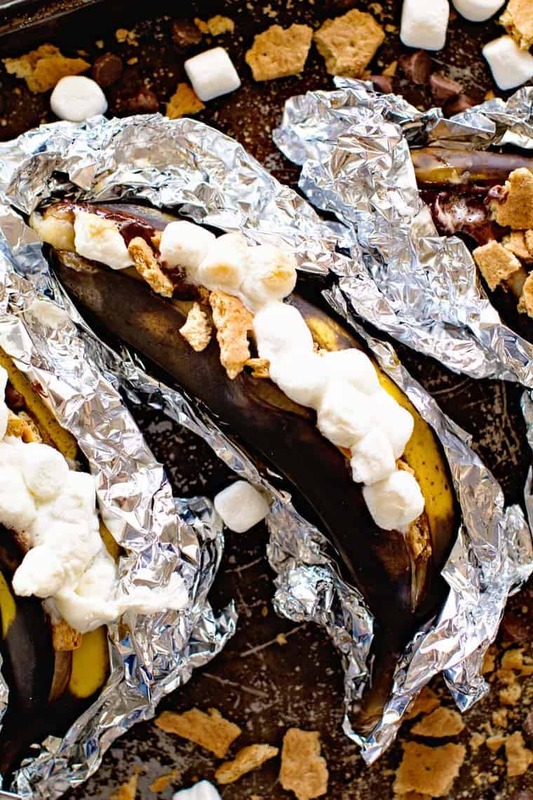 It’s time to go make these S’mores Banana Boats! A classic campfire treat! 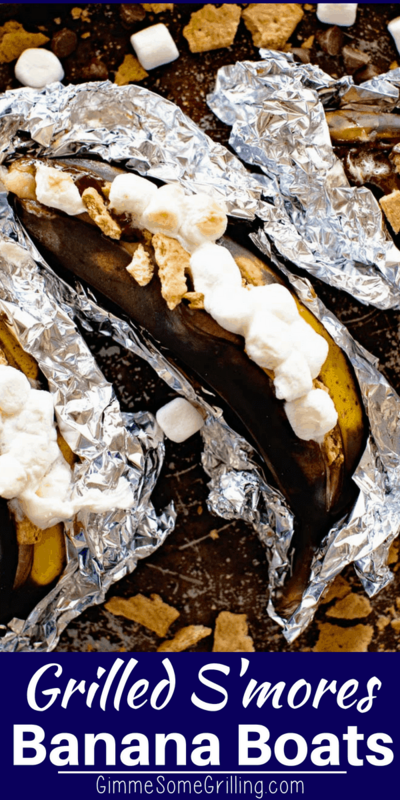 These S'mores Banana Boats are so delicious and easy. 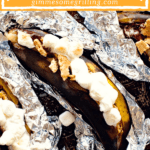 This is such a fun banana boat recipe to make on your grill or over your campfire. Grilled Banana topped with gooey marshmallows, melted chocolate chips and graham cracker crumbs! 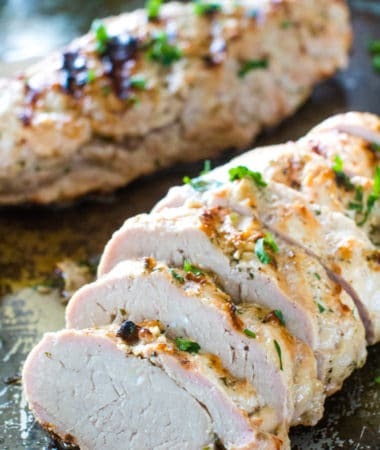 Preheat grill to medium-high heat about 350 degrees F.
Cut 4 sheets of heavy duty foil about 12''. Cut the banana lengthwise along the inside curve of the banana. Careful not to cut all the way through. Open slit to form pocket. 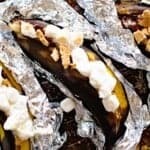 Place banana on top of foil. Hold each banana in your hand with foil. Fill pocket with chocolate chips, marshmallows and graham crackers. 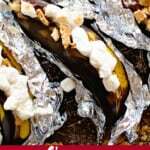 Fold foil around the banana and crimp to seal foil packet. 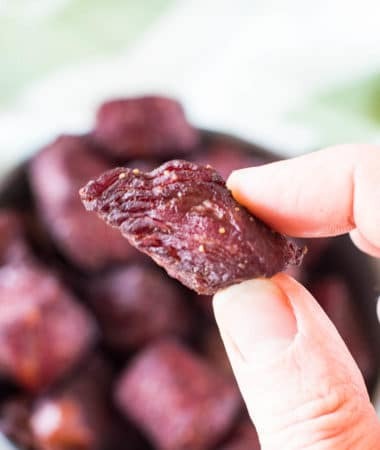 You can also make these in an oven preheated to 350 degrees F.
These can also be placed on campfire coals to cook. Thinking about adding peanut butter- under the chips and mallows. What do you think?